Review: I enjoyed my playthrough of last years Uncharted 4 and Lost Legacy was intended as a singleplayer DLC expansion. However, it grew into a small standalone title of it's own. Having bought it on launch, I played through it quite intensively on it's first weekend after release. I'd read some previews that indicated the approach this time around was less linear than UC4's. Therefore my interest sparked me into a pre-order deal which included another Naughty Dog favourite of mine; Jak and Daxter. More on the latter in another review! 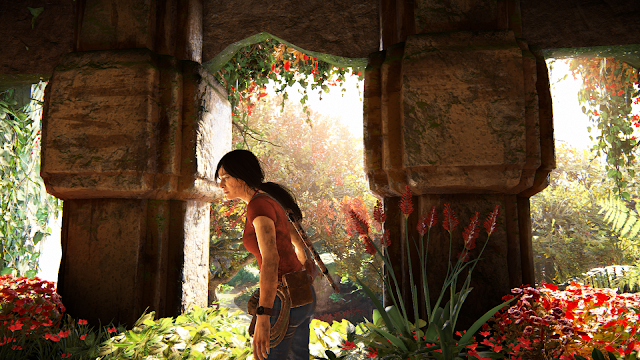 Now lets talk a bit about how the ladies of Uncharted do a better job than the men! My main complaint about UC4 and that goes for quite a few of Naughty Dog's story driven and cinematic focused games; is that they tend to be extremely linear. There's basically a game going from A to B, and while the travelling and varied locations is a positive experience, it also brings down the need to explore. 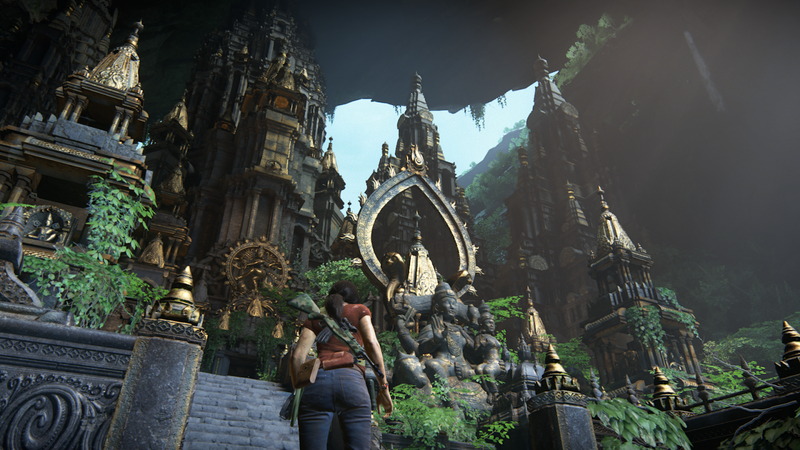 For a series that's heavily inspired by Tomb Raider, missing the exploration freedom is a downer for me. The newer TR games have shown that larger, less linear and more exploration focused hub worlds work quite well with the formula. Luckily, Lost Legacy has taken the complaints about UC4 to heart and perhaps the delivered the best Uncharted experience I have come over. 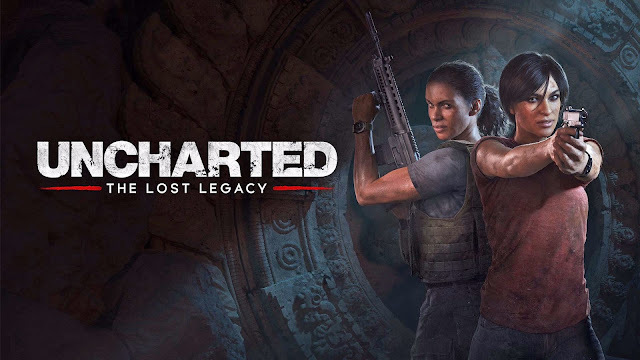 ULL takes place after UC4 and leaves Nathan and Sam Drake to focus on Chloe Frazer from UC2 and Nadine Ross from UC4. Unlikely partners in personalities, they find themselves needing to help each other out to retrieve an artefact named "the tusk of Ganesh" in India. Chloe is the master thief and archaeology expert, while Nadine is the weapons specialist. Their conversations bring some really memorable and funny moments to listen to, much like how Nathan and Sam chatted away together in UC4. Although you only control Chloe, you are often in need of Nadines help. It's a great sense of frienship building up along ht way, with small story pieces of the their earlier lives. Chloe and Nadine are some fantastically written, strong female leads. 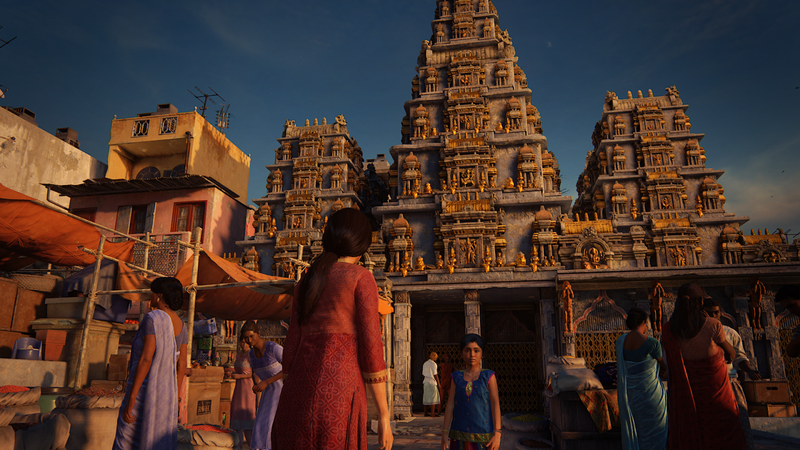 Apart from the opening cityscape of an Indian town set at night, the game is set in one location the rest of playtime. While this is a slightly more budget title, with a large reuse of visual environments from UC4, it makes up for itself by introducing a fantastic open-ended gameplay structure midway. It opens into a fairly large open area with a large tower in the center. 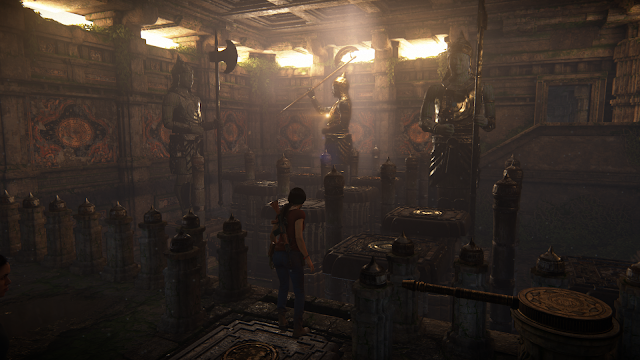 Here you need to explore different locations surrounding it and activate triggers to gain access to an ancient door. This open structure leaves lots of hidden places to find and tiny tombs to be solved. It's a small but wonderful nod towards the two last Tomb Raiders. This part alone made up for the linearity that brought UC4 down for me. While the open-ended structure doesn't last through-out, there's enough breathtaking places to find in the latter, more linear, half of the game to make up for it, for one reason alone; the game focuses on solving ancient puzzles in a larger degree. ULL understands where it's heritage evolved from and embraces it. Focusing less on generic shooting and more on good old tomb raiding without an obvious linearity. With this focus on exploring freely, the gunfights actually felt more welcome this time around. Don't get me wrong here though, this is not a full sized game unlike UC4, the vast location variation and grander build up of story is at a lower end of the scale here. Look at it more as an indie sized title with a triple A budget in development. In fact, it's a generous one at that, clocking in at around 8-10 hours of gameplay. UC4 was about 16-20 hours in comparison. ULL lasts longer of course if you go searching for secrets, and in fact it rewards you so in a better way. The exploring in the open-ended area is highly recommended and kind of the essence of this expansion. I would recommend playing UC4 first in any case though, to get your head around the UC4 world and gameplay, but this is a absolute must-buy afterwards. 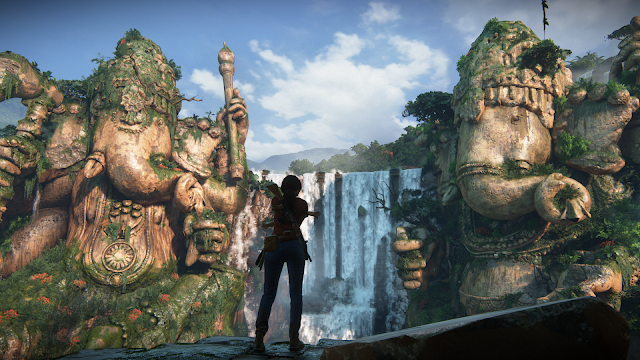 Once again, like UC4, ULL delivers some of the most beautiful visuals in the genre around- Showcasing that Naughty Dog are some of the best when it comes to character animation especially. 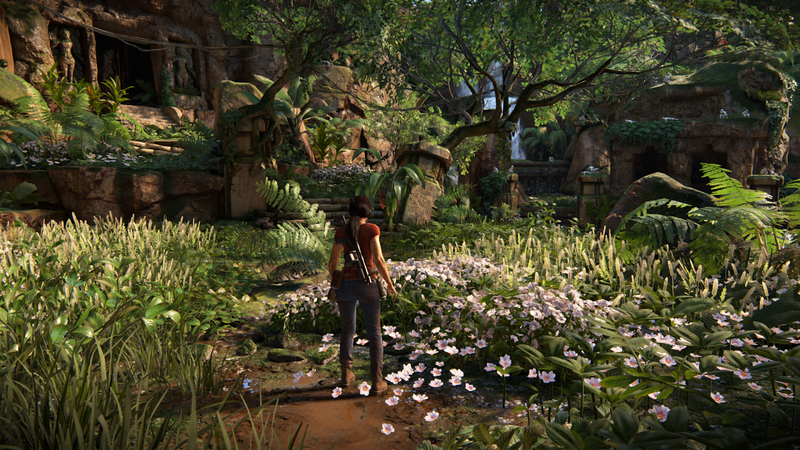 This game is a welcome surprise and a fantastic experience that fixed that itch for a new Tomb Raider game. I guess exploration is just better when women take the lead role! Less linear than UC4 and a welcome open world approach. Fantastic main characters, Chloe as a newcomer in the UC4 universe is a great heroine throughout the game. Breathtaking visuals and locations to explore, this game engine is just incredible visually. New designed areas, but lends a lot of the visuals directly from UC4. Shooting mechanics and enemy AI still feel simple. Climbing still feels a too automated at times.